I have to think you could modify mortar bombs in a similar way. Perhaps the mortar would have to be spigot mortar to better accommodate the wings. The Russians are already fielding suppressed mortars, by the way. I haven’t followed Neovictorian’s list, but I have spent more time on my Kindle and less on my phone. Long haul airplane flights that are more than 10 hours in duration would “be cannibalized” by point-to-point flights on rockets, UBS said. The firm pointed to SpaceX’s plans to use the massive Starship rocket it is building to fly as many as 100 people around the world in minutes. SpaceX said that Starship would be able to fly from New York to Shanghai in 39 minutes, rather than the 15 hours it takes currently by airplane. Using James Reason’s explanatory framework (Human Error, 1989), pilots flying the Boeing 737 Max 8 and encountering the opaque workings of MCAS (manoeuvering characteristics augmentation system) are carrying out intentional but mistaken actions: they are trying to pull a plane out of a dive. The plane is in fact climbing away from an airport after takeoff, but a failure in an angle of attack indicator has convinced MCAS that it is in a stall condition. (For extra money, you can buy a second angle of attack indicator, and apparently these two airlines did not do so. For safety, two should be standard at no extra cost). Accordingly, MCAS puts the nose of the plane down to avoid the stall. The pilot reacts by pulling back the yoke so as to resume upward flight, cognizant of the plain fact that unless he can gain height he is going to die, together with his passengers. His action satisfies MCAS for a short while, and then it comes in again, helpfully trying to prevent a stall (because pulling on the yoke is not enough: the whole tail plane has to be “trimmed” into the proper angle). Pilots are doing what comes naturally to them. MCAS is diligently doing as instructed, but is badly designed, relying as it does in this case on a single indicator, rather than two which could identify and resolve discrepancies, and has no common sense about the overall circumstances of the plane. The pilots know that they have just taken off. MCAS, as far as I know, does not “know” that. Again, as far as I know, MCAS does not know even what height the plane is at. (I know that this is not real Artificial Intelligence, but I used it as an illustration of some of the problems which may arise from AI in transport uses). The pilots respond with “strong-but-wrong” actions (which would be perfectly correct in most circumstances) and MCAS persists with “right-but-wrong” actions because of a severely restricted range of inputs and contextual understanding. Chillingly, it augments a sensor error into a fatal failure. A second sensor and much more training could reduce the impact of this problem, but the inherent instability of the engine/wing configuration remains. Using Reason’s GEMS system, the pilots made no level 1 slips or lapses in piloting. They had followed the correct procedures and got the plane off the ground properly (once or twice a pilot forgets to put the flaps down at take-off or the wheels down at landing). I think they made no level 2 rule-based errors, because their rule-based reactions were reasonable: they considered the local state information and tried to follow a reasonable rule: avoid crashing into the ground by trying to gain height. They could be accused of a level 3 error: a knowledge-based mistake, but the relevant knowledge was not made available to them. They may have tried to problem-solve by finding a higher level analogy (hard to guess at this, but something like “we have unreliable indicators” or “we have triggered something bad in the autopilot function”) but then they must revert to a mental model of the problem, and think about abstract relations between structure and function, inferring a diagnosis, formulating corrective actions and testing them out. What would that knowledge-based approach entail? Either remembering exactly what should be done in this rare circumstance, or finding the correct page in the manuals to deal with it. Very hard to do when the plane keeps wanting to crash down for unknown reasons shortly after take-off. Somewhat easier when it happens at high altitudes in level flight. At this point it needs to be pointed out that there is some confusion about how easy it was to switch off CMAS. All the natural actions with the yoke and other controls turn if off, but not permanently. It comes back like a dog with a stick. Worse, it will run to collect a stick you didn’t throw. The correct answer from the stab trim runaway checklist, is to flick two small switches down into the cut out position. Finding them may be a problem (one does not casually switch things off in a cockpit) and for those not warned about the issue, the time taken to find out the required arcane procedure may be insufficient at low altitudes, such as after take-off. Understandably, pilots did not understand the complexity of this system. They had a secret co-pilot on board, and hadn’t been told. Twenty-three lines of his Historia, the ancient world’s first great narrative history, are devoted to the intricate description of the construction of a “baris”. Commercial release of experimental piloted versions. In order to compensate for severe inferiority in guidance technology for its first generation ICBMs, the Soviets during the 60s and early 70s developed very high yield hydrogen bombs which didn’t need to land close to their targets to accomplish their mission. During the 1960’s, the United States chose to halt strategic missile production and deployment. Instead, the Soviets took the opportunity to achieve numerical parity but with much larger boosters; and when parity was achieved, showed little inclination to halt weapon development and deployment. With two or three times as many warheads on missiles as the U.S. has — all of them of substantially higher yield and comparable targeting accuracy as the U.S. ones — the Soviets will be able to wipe out all U.S. land-based forces (including all 4000 MX aim-points) with well under half of their ICBM order-of-battle. Nuclear reactor-powered Soviet naval reconnaissance satellite capability has posed a major threat to U.S. sea-power for most of the past decade. What is little-recognized is that these intensively powered (100 kilowatt level), massive military satellites also provide an ideal platform for rapid, entirely covert deployment of advanced anti-submarine warfare (ASW) systems, exploiting a wide variety of radar, optical, and other non-acoustic technological advances of the last several years. The U.S. has no analogous capabilities — either operational or in serious development. The U.S. cannot put a 10kW electric power supply of any kind into orbit until the mid-80s (and only if development begins promptly could we do so then), but the Soviets have had a routinely exercised order-of-magnitude greater capability since the mid-70s. There is no credible evidence which suggests that the Soviets would hesitate to use such demonstrated capabilities to wage space-directed nuclear war-at-sea against U.S. military forces, even if the geopolitical situation were substantially short of all-out-war; indeed, all available evidence supports the thesis that the Soviets consider U.S. Navy forces to be ‘pure’ military targets, useful for demonstrations of Soviet strength and resolution in times of crisis without generating the massive civilian casualties which would require a U.S. president to escalate or capitulate. Soviet anti-satellite capabilities also have no analog in U.S. capacities. As was widely publicized two years ago, the Soviets have demonstrated a capability to attack (or at least effectively confuse) our strategic warning satellites. These satellites give warning of a ballistic missile attack against the United States by detecting the very strong infrared radiation signals given off by the exhaust plumes of ICBMs rising through the atmosphere from their silos. According to open literature accounts, the Soviets were able to blind them and thus negate their warning capability. The Soviets have also repeatedly demonstrated the ability to use ‘killer satellites’ to intercept and destroy essentially any type of satellite in reasonably low Earth orbit. In-space attacks are likely as a prelude to war on not only U.S. strategic reconnaissance satellites, but also on command, control, communications, and intelligence satellites which are increasingly vital to the ability of the National Command Authority to direct U.S. forces in the event of hostilities. Unlike the Soviet Union, the U.S. has committed a critically large fraction of its war-waging assets to the space environment. However, we have not taken commensurate action to defend these assets from any but implausibly trivial types and levels of threats — and the Soviets know it. When operating in pulsed mode, beam weapons load the surfaces of their targets with destructive amounts of energy on time scales of a millionth of a second or less; the surfaces evaporate with forces far greater than that of a comparable thickness of TNT, usually destroying the structures under them in the process. Deployed in high Earth orbit, one such station could potentially burn down all the missiles launched from whatever locations by one side during an all-out nuclear war, and then leisurely burn down all enemy bombers for an encore. If such a space laser battle station could defend itself from all types of attack which enemies of its owners could direct against it, its ownership would confer the prize of a planet — just as soon as it was put into orbit. On the other hand, pulsed space lasers energized by nuclear weapons exploding nearby — lasers which have been demonstrated by the U.S. in underground tests and in whose development the Soviet Union is widely believed to be several years ahead — may be effectively impossible to countermeasure. They deliver too much energy of too penetrating nature in too short a period of time to defend against by any means known at present. These defensive weapons are kept in hardened silos, to be launched as soon as an enemy ICBM attack is detected. A dozen such bomb-energized laser systems — each launched by a single booster — could shield their owner’s home territory from enemy attack for the half-hour period necessary for its owner’s ICBMs to be launched at, fly to, and destroy the enemy’s missile and bomber fields. Strategic-scale war in the closing sixth of this century is thus likely to conclude with the total and quite bloodless triumph by the nation owning the space laser system(s); the winner’s ICBM fields are part-empty, while the loser’s missiles and bombers are totally destroyed. The loser’s cities are held hostage for the surrender of his submarine force, whose remaining missiles are impotent against the space laser weapons of the winner in any event. The large present and near-term Soviet advantage in the ability to place large payloads into a variety of Earth orbits and to generate large amounts of electric power with space nuclear power systems may well be decisive in the on-going race to first deploy the first-generation space beam weapon battle stations. Launched between 1967 and 1988 to monitor NATO and merchant vessels using radar, the satellites were powered by nuclear reactors. Because a return signal from an ordinary target illuminated by a radar transmitter diminishes as the inverse of the fourth power of the distance, for the surveillance radar to work effectively, US-A satellites had to be placed in low Earth orbit. Had they used large solar panels for power, the orbit would have rapidly decayed due to drag through the upper atmosphere. Further, the satellite would have been useless in the shadow of Earth. Hence the majority of the satellites carried type BES-5 nuclear reactors fueled by uranium-235. Normally the nuclear reactor cores were ejected into high orbit (a so-called “disposal orbit”) at the end of the mission, but there were several failure incidents, some of which resulted in radioactive material re-entering the Earth’s atmosphere. The US-A programmer was responsible for orbiting a total of 33 nuclear reactors, 31 of them BES-5 types with a capacity of providing about two kilowatts of power for the radar unit. In addition, in 1987 the Soviets launched two larger TOPAZ nuclear reactors (six kilowatts) in Kosmos satellites (Kosmos 1818 and Kosmos 1867) which were each capable of 6 months of operation. The higher-orbiting TOPAZ-containing satellites were the major source of orbital contamination for satellites that sensed gamma-rays for astronomical and security purposes, as radioisotope thermoelectric generators (RTGs) do not generate significant gamma radiation as compared with unshielded satellite fission reactors, and all of the BES-5-containing spacecraft orbited too low to cause positron-pollution in the magnetosphere. The last US-A satellite was launched 14 March 1988. The greatest blunder of World War II? Major-General JFC Fuller, the man credited with developing modern armored warfare in the 1920s, called failure to use it “the greatest blunder of the whole war.” He even suggested that British and American tank divisions could have overrun Germany before the Russians — if it had been deployed, that is. The angle of the beam dispersion was 19 degrees which meant that if the CDL tanks were placed 30 yards apart in line abreast, the first intersection of light fell about 90 yards ahead and at 1000 yards the beam was 340 yards wide by 35 feet high. This formed triangles of darkness between and in front of the CDL’s into which could be introduced normal fighting tanks, flame-throwing Churchill Crocodiles and infantry. A further refinement was the ability to flicker the light. On the order given for ‘Scatter’, an armour plated shutter was electrically oscillitated back and forward at about six times a second. When first produced it was thought that this flicker effect (similar to the modern disco strobe lights) would have a damaging effect on the eyes of any observer and might cause temporary blindness. It was the flickering aspect that made the CDL special. The makers found that when it was employed, it was impossible to locate the vehicle accurately. In one test, a CDL-equipped vehicle was driven towards a 25-pound anti-tank gun. Even as it closed from 2000 yards to 500 yards, the gunners (firing practice rounds, one assumes) were unable to hit the tank. 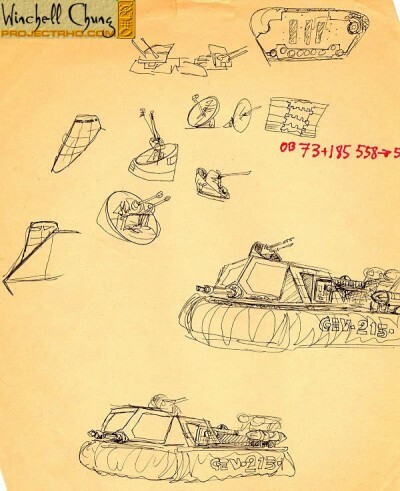 When asked to draw the route taken by the CDL tank, the observers drew a straight line, while in fact the tank had been crossing the range from side to side. Spraying the area with machine-gun fire would not work either; the armored reflector of the searchlight kept functioning, even after being hit repeatedly. Was the term “GEV” just a mistake? 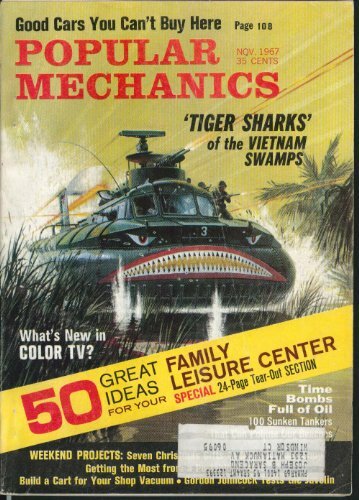 Back in 1977, Steve Jackson Games came out with a sci-fi wargame named after the giant cybernetic tank central to its futuristic setting, the Ogre. Other units included infantry, artillery, and highly mobile hovercraft — known in the game as GEVs, or Ground Effect Vehicles. Years later I learned that a ground effect vehicle is not a hovercraft, or air cushion vehicle, but a winged airplane, designed to use the wing-in-ground-effect — the reduction in drag experienced by an aircraft as it approaches a height approximately twice a wingspan’s length off the ground (or other level surface such as the sea). 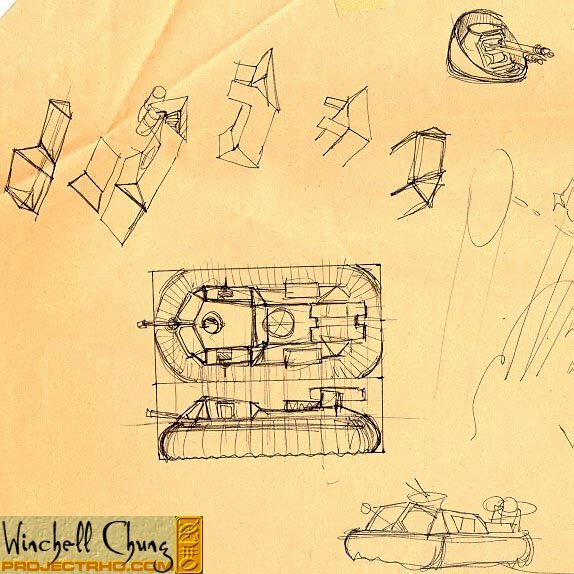 Winchell Chung, who runs the Atomic Rockets website and goes by the handle of Nyrath, did the original art for the game, and I recently asked him, was the term “GEV” just a mistake? Or were they not meant to be air-cushion vehicles (ACVs) originally? 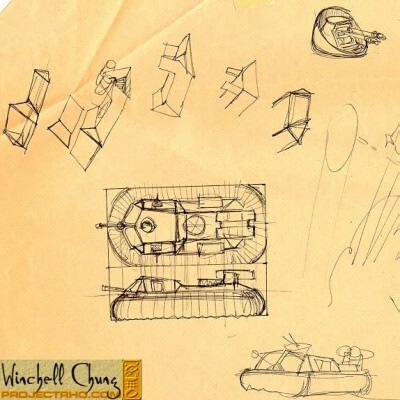 The draft rules described units as armored hovercraft. Not aircraft. Fast moving ground units. They were called GEVs. 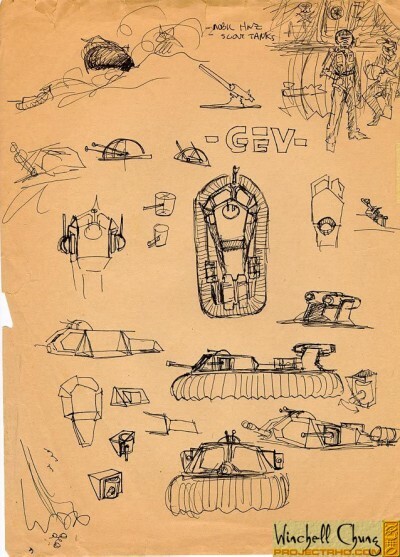 I vaguely remember reading that GEM [for Ground Effect Machine] was a synonym for hovercraft, and I assumed GEV was a variant. I used a Popular Mechanics cover as inspiration. During the Vietnam War, the US used what it called “Lazy Dog” bombs. These were simply solid-steel pieces, less than 2 inches long, fitted with fins. If you drop a telephone pole-sized (20′×1′) tungsten cylinder from orbit, the 9-ton “rod from God” should hit at Mach 10, with the kinetic energy equivalent to 11.5 tons of TNT (or 7.2 tons of dynamite). One of the most difficult security missions which the United States must accomplish is the protection of our interests around the globe. Incidents like the North Korean seizure of the USS Pueblo have demonstrated our weakness in not being able to respond quickly and authoritatively in remote locations. Our only solution to this problem so far has been the naval carrier task force. Carrier-based aircraft can project military force to protect our citizens and allies in remote regions of the world. Unfortunately, the high cost and vulnerability of nuclear carriers and their required aircraft and support fleets make them an unattractive solution. To balance the force of gravity, a satellite two hundred miles above the surface must travel at a speed of seventeen thousand five hundred miles per hour. At this speed, the satellite travels around the Earth once every ninety minutes. With a hundred satellites in orbits near this altitude and traveling in random orbital inclinations, one of the satellites will pass over any given location on Earth every thirty minutes. With a thousand satellites, the timing between satellites overhead is less than ten minutes. The basic physics of orbital motion gives us our global coverage; it also gives us the weapon. The extremely high velocity of a satellite in orbit gives it a tremendous amount of kinetic energy. If a one pound object moving at orbital velocity ran into a stationary target, the energy released in the impact will be the equivalent of exploding almost ten pounds of TNT. The THOR system is composed of a thousand or more cheap satellites, each made up of a bundle of projectiles, guidance and communications electronics, and a simple rocket engine. The result is spectacular: a bundle of tens or hundreds of twenty pound projectiles streak down at four miles per second to strike targets with the explosive equivalent of two hundred pound bombs each. Even if an enemy were to detonate one or more nuclear devices in space in an attempt to destroy THOR, there are a thousand or more widely scattered satellites he must destroy. Because the satellites are at different altitudes and have different orbital inclinations, any holes produced in the global coverage by a nuclear explosion are filled in after several hours by the orbital motions of the satellites. The satellite can be cocooned in foam, which would be difficult to detect with radar anyway and could be shaped to make detection even more difficult (stealth satellites!). The foam would insulate the satellite against the heat and shock of nuclear explosions or laser beams. The jet of metal particles produced when a shaped charge warhead detonates is traveling at about the same velocity as a THOR projectile when striking a target. The jet of metal from the TOW warhead weighs only a fraction of an ounce; a THOR projectile weighs over twenty pounds! If the projectile were composed of an outer shell with sand-sized particles inside, it could be designed to explode and disperse the particles just before impact. The metal particles would instantly vaporize, with the resulting shock wave flattening troops, aircraft, or other targets much like the fuel-air explosive bombs presently in service. The advantages of the THOR weapon system are its low cost, global coverage, quick reaction time, and survivability. To de-orbit the projectiles and bring them down at an angle of thirty degrees from vertical requires almost as much energy as was required to orbit the projectiles initially, and requires a large quantity of propellant for each THOR satellite. The individual THOR satellites are most vulnerable while the de-orbit propulsion burn is taking place, when a rocket exhaust plume is a bright beacon marking the location of the satellite for possible destruction by enemy laser weapon satellites. Two solutions are a cold gas propulsion system (high weight of propellant required) or a very fast propulsion impulse which ends before the laser weapon could be brought to bear on the THOR satellite. With the Global Positioning System navigation satellite network in operation, each satellite could passively receive its own location in space to a very high accuracy while doing nothing to reveal its own position. Communication by laser beams, which are extremely narrow and almost impossible to intercept, may be possible if the position of each of the thousand or more THOR satellites can be calculated accurately enough to hit the desired satellite. The projectile could be protected by an ablative nose tip which would vaporize and carry off the heat from atmospheric friction during the few seconds of atmospheric passage. The high speed of the projectile through the atmosphere near the ground where the density of the air is highest would produce a luminous bow shock wave directly in front of the missile. Penetrating such a layer might be a problem, but high frequency radio waves, infrared light, visible light, or ultraviolet light might be effective for targeting. A visible light sensor might have a window covered with a filter which passes light of a wavelength which is not emitted by the ionized air in the shockwave. The real point of the system, as he points out, is that it could quickly (and cheaply) hit any target, anywhere on earth — which seemed really, really useful, a few months later, when HMS Sheffield succumbed to a French-made Exocet missile in the Falklands. Of course, getting tungsten rods up into space is only economical once you have frequent launches of your newfangled space shuttle. Four Thieves claims to have successfully synthesized five different kinds of pharmaceuticals, all of which were made using MicroLab. The device attempts to mimic an expensive machine usually only found in chemistry laboratories for a fraction of the price using readily available off-the-shelf parts. In the case of the MicroLab, the reaction chambers consist of a small mason jar mounted inside a larger mason jar with a 3D-printed lid whose printing instructions are available online. A few small plastic hoses and a thermistor to measure temperature are then attached through the lid to circulate fluids through the contraption to induce the chemical reactions necessary to manufacture various medicines. The whole process is automated using a small computer that costs about $30. To date, Four Thieves has used the device to produce homemade Naloxone, a drug used to prevent opiate overdoses better known as Narcan; Daraprim, a drug that treats infections in people with HIV; Cabotegravir, a preventative HIV medicine that may only need to be taken four times per year; and mifepristone and misoprostol, two chemicals needed for pharmaceutical abortions. The catalyst for Four Thieves Vinegar Collective was a trip Laufer took to El Salvador in 2008 when he was still in graduate school. While visiting a rural medical clinic as part of an envoy documenting human rights violations in the country, he learned that it had run out of birth control three months prior. When the clinic contacted the central hospital in San Salvador, it was informed the other hospital had also run out of birth control. Laufer told me he was stunned that the hospitals were unable to source birth control, a relatively simple drug to manufacture that’s been around for over half-a-century. He figured if drug dealers in the country were able to use underground labs to manufacture illicit drugs, a similar approach could be taken to life-saving medicines. Eric Von Hippel, an economist at MIT that researches “open innovation,” is enthusiastic about the promise of DIY drug production, but only under certain conditions. He cited a pilot program in the Netherlands that is exploring the independent production of medicines that are tailor made for individual patients as a good example of safe, DIY drug production. These drugs are made in the hospital by trained experts. Von Hippel believes it can be dangerous when patients undertake drug production on their own.